Tecnet operates major support centres in Victoria and Vancouver; where we also operate our dispatch call centre and helpdesk in addition to our field service operations. 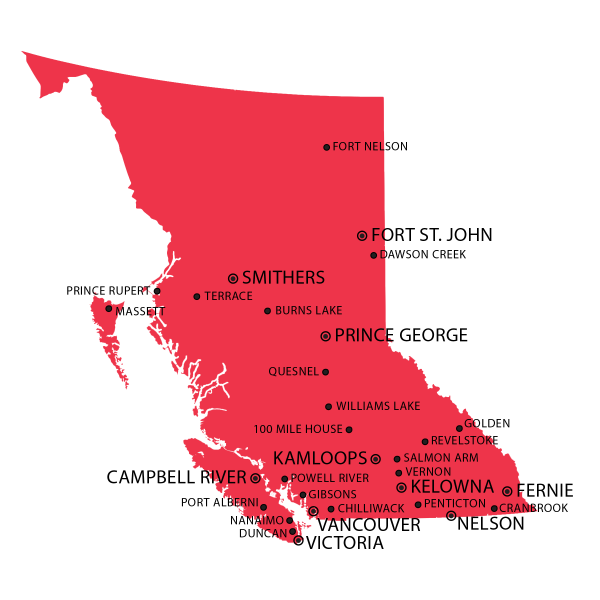 Tecnet operates a service network of Tecnet Authorized Service Centers (ASCs) in more than 35 local communities across British Columbia. Tecnet employs more than 40 professionals in Victoria & Vancouver, and supports the local employment of more than 200 additional technical professionals through our ASC network. Our unique network of Authorized Service Centers (ASCs) is a well-developed affiliation of independent local service companies that receive annual training and ongoing central support from Tecnet. Our commitment to training across the Tecnet ASC network ensures our partners and customers receive seamless local service and a verifiable high standard of technical excellence. Our ASC commitment includes central service administration and dispatch, technical support, extensive multi-vendor technical training resources, logistics support and central parts management. It is an enduring commitment to local business and the development of local expertise with a twenty-year average ASC affiliation. Click the pins below to view addresses, phone numbers, and driving directions for our Authorized Service Centres. If you’re interested in joining our team as a Tecnet Authorized Service Center – Get In Touch. Don’t see a Service Centre in your area? Contact us to find out about our remote travel rates.